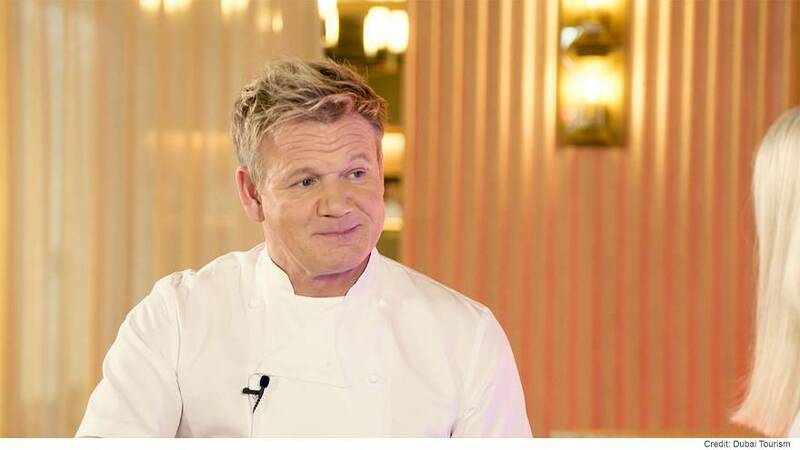 Gordan Ramsay is one of the richest chefs in the world, a former footballer, a television star and a family man: his diverse collection of bars and eateries, 'The Gordon Ramsay Group,' currently employs more than 700 people in 15 restaurants in London. In total, he has 35 establishments across the globe in Europe, the Middle East, Asia and the United States. Born in Scotland and raised in the UK, Ramsay's restaurants currently hold seven Michelin stars (over the years the Brit has been awarded 16 Michelin stars). Married since 1996, he has five children. Euronews caught up with the British celebrity chef in Dubai to talk about life, career and politics. "I fell in love with Dubai 18 years ago"
Jane Witherspoon, Euronews: "Gordon we're joining you here, at Hell's Kitchen, Caesar's Palace, Dubai, did you ever think you would get to this point?" Gordon Ramsay, Michelin-starred chef: "No, I mean pretty incredible. I mean I fell in love with Dubai 18 years ago when we opened up at the Creek, years ago look what's happened to Dubai since then, it's been incredible. So, it is a foodie city for me, highly competitive, great market, huge European sector descend upon Dubai now, more than ever before, guaranteed weather, guaranteed good food and an amazing beach." Jane Witherspoon, Euronews: "Is it still difficult to open a restaurant in a saturated market, because there's so many here?" Gordon Ramsay: "It's very difficult because competition is rife, trends are moving on a daily basis. You've got to be the hottest thing, the best-looking thing, sometimes the cheapest thing and that's not possible when you're running a restaurant, so it doesn't get easier, put it that way." Jane Witherspoon, Euronews: "Any plans to film Hell's Kitchen here like you do in Vegas?" Gordon Ramsay: "I don't think I would get away with half my language, live, here. Unfortunately it is an industry, language, some bad words do come out when it hits the fan. I'm just an honest guy, I just get on with it. "So, we've just picked up Season 19 and 20. We will be shooting that with Caesar's Palace in Vegas." Jane Witherspoon, Euronews: "How different is it doing business here as opposed to Europe or the American market?" Gordon Ramsay: "Yeah, it's not just about the food, is about the atmosphere, the ambiance, the bar, the drinks the service, the etiquette. It's a compelling market but you have to be very careful, very similar to LA, it moves in trends and that sort of 18 month threshold, if you're still pretty decent after 18 months, 2 years, you're going to be here for a long time." "you're on the sort of cusp of Mayfair teetering on Chelsea"
Jane Witherspoon, Euronews: "Where do you think Dubai sits on the global cuisine scale?" Gordon Ramsay:"You just have to look at the amount of top chefs here now. At times you could sit and think you're in the middle of the Champs-Élysées in Paris, other times you could think you're on the sort of cusp of Mayfair teetering on Chelsea and then the weather, sitting out until 9, 10,11 o'clock at night enjoying good food without it pelting down with rain." Jane Witherspoon, Euronews: "Now, sixteen Michelin stars: greedy, just clever or do you think is it a bit of a poisoned chalice, that everyone expects something?" Gordon Ramsay: "You know last year we lost Joël Robuchon, sadly, he, 38 Michelin stars. The guy was extraordinary, I worked with him for a year. Alain Ducasse currently is on 21 stars. Has Cristiano Ronaldo played enough Champions League football? It's passion I think. So it's not just me. You know right behind me currently there (here) is a team and whether it's Craig here, Christina in Vegas. Matt Abé in London or Clare Smyth heading up her own business now so it's a tough game this. So, it’s not about the more stars the merrier I think it's just the passport of greatness when you get a star, you get awarded in October what you cooked the year before ,so it's just another confirmation to how good you are that's not me that's the team I just get the best out of them." Jane Witherspoon, Euronews: "How do you handle the fame that comes with the level of success that you have now?" Gordon Ramsay: "I never, I mean I have an amazing mum who keeps me incredibly grounded and next to her is an amazing wife...so fame how do you, I mean, I'm just busy. So you don't go out looking for plaudits. If anything I'm more intimidated by going out. Jane Witherspoon, Euronews: "Congratulations on your fifth child"
Gordon Ramsay: "Yeah, number five!" Jane Witherspoon: "But you know, are you going to keep going?" Gordon Ramsay: "I don't think that's a good idea to keep going but I think we keep them stable, 5 kids is a lot! And I think today the pressure on them is far greater than it was when I was growing up because they're distracted (far) way greater than I was, you know we didn't have that phenomenal access to the internet. You know, I just look at my assistant, he’s here somewhere, every time he wants a girlfriend or a date just swipes left or right...so courting was important and having three daughters watching them in and out of relationships you know it's a tough it's a tough time for them so. Yeah they're way more distracted I was." Jane Witherspoon, Euronews: "Are you a tough dad when it comes to boyfriends like that?" Gordon Ramsay: "From a very early age I always begged them to say the quicker you tell me the more I can do. And that really has resonated and ‘am I tough?’ I’m very fair with them. Very fair, very honest and I just want them to find their passion I think really (with), not relying on me or Tana...it’s not about inheritance, fame, fortune, 1st class air tickets… just find your passion. So, Megs studying criminology, Holly’s into fashion and Jack wants to be in the military." Gordon Ramsay: "And Tilly, Tilly’s away with the fairies." Jane Witherspoon, Euronews: "As she should be." Gordon Ramsay: "One day she’s a doctor and the next day she’s a chef. The next day it’s Blue Peter and it’s like whoa, Tilly!" Jane Witherspoon, Euronews: "Girl after my own heart." Jane Witherspoon, Euronews: "Obviously they’re growing up in a very different world. And you know – Brexit…how is the impact of that going to affect the culinary industry?" Gordon Ramsay: "That’s a really good question I think the middle tier of the sector over the last 3 years has been saturated. "So, we’re four and a half percent up from year on. I think there's a lot of uncertainty to what's happening. I think the quicker the deal is done we can get our heads down and reposition where we should be as a great nation. Will it affect restaurants? Those of quality – definitely not. Those flying off the radar – yeah definitely. My workforce I think we have about 72 percent Europeans...72 percent, so if you refer back to the National Apprentice and install that level of passion again. You know we should be fine. We're a hardworking nation, so when the deal is done and we exit everyone will revert back to normal and put their head down and stand for what we believe in. It's hard for me because I'm half Scottish. I was born there but never really lived there so...I love Britain it's an amazing place to grow up, great values, amazing country and so it's called Great Britain for a reason! We should remember that." Jane Witherspoon, Euronews: "You mentioned Scotland there. Would you if you had the opportunity rather be a Scottish footballer or a chef?" Gordon Ramsay: "That’s a really good question. I think under the age of 30 definitely a footballer. Early 50’s definitely a chef without a doubt, but I think that level of training and not just training but discipline, professionalism, keeping it straight, so… it's a tough game football, again it could be gone in seconds like it was for me in the injury and you just have to dust yourself down, pick yourself up and get on with it." "I got over the stage with money a long time ago"
Jane Witherspoon, Euronews: "Do you pinch yourself sometimes when you look at what you have achieved?" Gordon Ramsay: "I think part of that drive is one day the fear of not having it. And when you grow up in the situation I grew up in everything you get you appreciate 10 times more, so it's not going to go away. I got over the stage with money a long time ago, so that's never been the drive." Jane Witherspoon, Euronews: "Gordon, thank you so much for joining us." Gordon Ramsay: "You’re welcome thank you so much. Look forward to seeing you for dinner!" How do you grow vegetables in the desert?